The past few decades have witnessed various innovations in terms of naval propulsion systems. Recent developments in Energy Storage Systems (ESS) allow for further design and operational refinement. This paper explains the development of a software tool that is based on a hybrid propulsion ship, having ESS options that can be interrogated to optimise vessel performance to achieve reduced fuel consumption and lower emissions. The study was based on a frigate-sized ship with multiple operating profiles and ability to perform Anti Submarine Warfare (ASW) operations. Software simulations were carried out for different mission profiles. Subsequently, the tool was used to estimate a payback interval for investment in ESS. The generated results show positive trends and indicate that such technologies can enhance capability by reducing noise signature and provide environmental and economical benefits. Ship design is a challenging business. In times of economic uncertainty, unstable oil prices, rising concerns about environmental pollution and shipping’s impact on global warming, there has never been a better time to design efficient and sustainable ships. While hybrid cars are an increasing success, the shipping industry is now moving towards the same green direction. Moreover, world trade is heavily dependent on commercial shipping (about 90 percent of goods are moved by sea) and warships are needed to meet increasingly demanding roles from defence of the nation to dealing with instances of terrorism, traffickers and piracy. Weaning ships off environmentally damaging diesel fuels is tough business because there is no obvious alternative. The importance of designing an efficient ship having a low polluting power and propulsion system is an essential test of the marine engineering skill but additionally consideration must be given to other design aspects such as higher levels of redundancy, lower noise signature, reduced maintenance costs and increasing power demand of (weapons)systems. Hybrid propulsion, which is a mix of mechanical and electrical systems, can provide a suitable solution in many instances. Combined propulsions for many years have been the choice for numerous warships having a sprint and cruise speed requirement. The arrangement allows for optimised use of Diesel Engines (DE) and Gas Turbines (GT) at these different speeds but at other speeds the prime movers will often operate sub-optimally using more fuel and producing more emissions. A possible solution to overcome such inefficiencies is to integrate Energy Storage Systems (ESS) powered electric propulsion in the existing configurations. The ESS can be used in different ways including allowing for ‘load-levelling’ and ‘peak-lopping’ which potentially helps in reducing consumption but it may also be exploited for other uses such as a ride through capability, as a stealth drive for quiet operations and in future warships to support electric weapons. 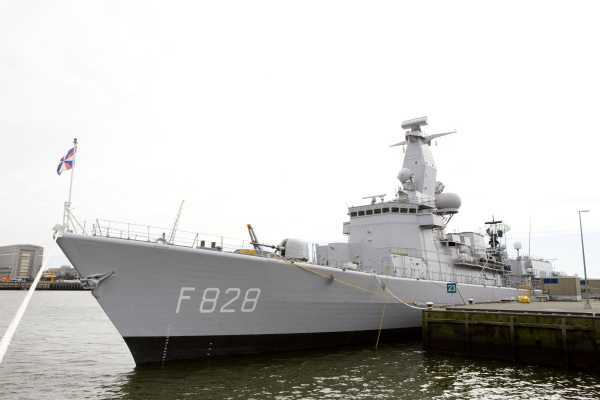 In 2015, the Netherlands Ministry of Defence published the Operational Energie Strategy (OES) aiming to ‘enlarge the operational autonomy of the Armed Forces by controlling the energy consumption on the one hand and shifting to alternative forms of energy on the other hand.’ The replacement of the Netherlands Karel Doorman-class multi-purpose frigates is now in its early design stage; no better moment to investigate if this design could benefit by using a hybrid arrangement for the aforementioned reasons. A more efficient use of prime movers would not only meet the aim of the OES 2015 but also helps to meet (inter)national energy-related objectives. The focus of this paper is the design and performance of hybrid propulsion systems using ESS considering warships. The investigation has been undertaken by developing a sizing package in MATLAB. Separate investigations undertaken in Hybrid Propulsion and ESS by the authors, as MSc dissertations have been combined and further expanded, developed and specially coded to understand the impact of ESS operations when used in a hybrid propulsion design. The aim of the investigation is to find out whether investing in ESS technology is beneficial, reducing environmentally polluting exhaust gases and economically viable for frigate-sized warships. The comparison is made for a hybrid propulsion based warship, operating with and without the use of ESS. The modelling work further seeks to establish the payback interval for investments made on Lithium-ion based ESS. The paper first gives a brief overview about the hybrid propulsion concept and ten potential ESS for a warship. The second chapter lays out three different ship scenarios which are simulated with the design tool. The third chapter is concerned with the integration of the ESS in a hybrid arrangement and the tool development used for this study. The fourth section presents the findings of the research, focusing on the ship scenarios. The last chapter describes at what level the aim is reached. Naval ship propulsions employ a mix of Diesel Engines (DEs) and Gas Turbines (GTs), commonly referred to as ‘Combined Propulsion’ configurations. This allows for economical operations at transit speeds of about 18 knots and also having the capability to attain sprint speeds (usually around 30 knots). In recent decades, with the advancement in electrical power conversion technologies, hybrid propulsion arrangements have been highly successful. One of the earliest examples of this technology is Royal Navy’s Type 23 Duke-class frigate. In these vessels, Anti-Submarine Warfare (ASW) operations requiring low noise signatures can be performed using electric motors as the source of propulsion, whereas GTs are switched on for achieving higher speeds. The Royal Navy’s future frigate the Type 26 will also be based on hybrid propulsion system. Hybrid propulsion systems exist in various combinations with a major element being ‘AND (A)’ or ‘OR (O)’. 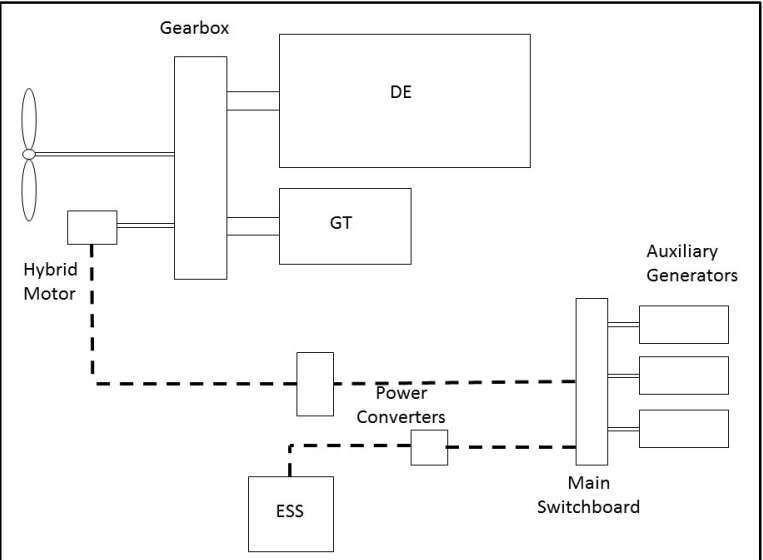 Table 1 shows commonly used combinations of diesel (D), gas turbine (G) and electric drives (L). Here the alphabet (CO) stands for ‘Combined’. The weighted objective method was applied to identify the most viable ESS for a warship using characteristics that were considered important from a naval perspective with key properties being physical, noise signature, electrical and miscellaneous (Figure 2). The choice of ESS for a warship is heavily influenced by mission requirements as well as economic viability. To date, large scale ESS have not been used extensively aboard commercial or warships although there are some battery operated ferries. A suitable ESS includes consideration of purpose that dictates capacity, rate of charge, rate of discharge, maximum peak power, safety, weight and volumetric density. 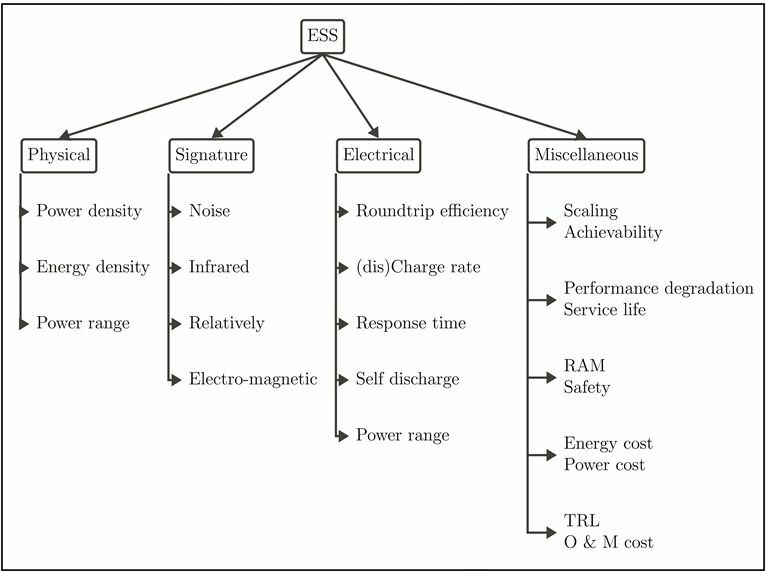 Table 2 gives key characteristics of the chosen ESS technologies. 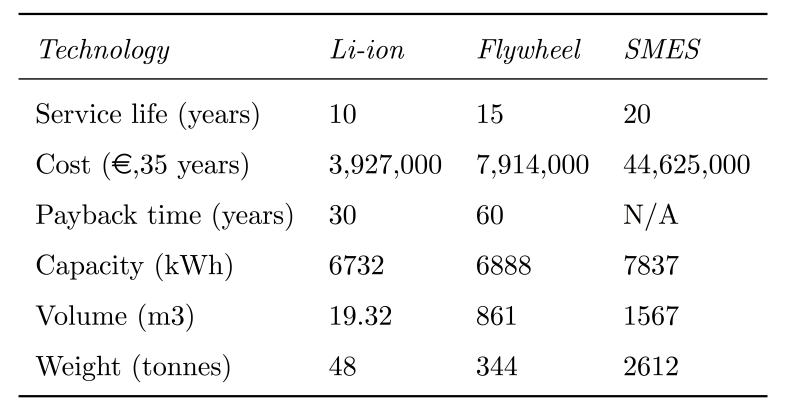 Comparing these technologies, a Lithium-ion battery ESS is up to 20 times more energy dense (volumetric and weight) than a kinetic flywheel and a SMES but it takes longer to charge. 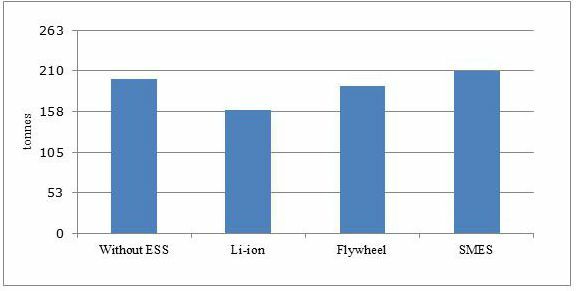 The service life of Li-ion is much lower than that of kinetic flywheel and SMES dictated by the number of operating cycles and its capacity reduces over time. The peak discharge power is also limited. However the Lithium-ion battery offers the best cost per unit and as mentioned earlier it is evident that costs will continue to fall, whereas the future costs of flywheels and SMES seem uncertain. Moreover, the significantly lower energy density (kWh/tonne) of SMES implies that a high capacity unit will cause an impact on ship’s tonnage. As with all energy sources, there are safety concerns with Lithium-ion batteries but much progress has been made in their recent inclusion in hybrid aircraft and road vehicles. Although magnetic flywheel and SMES type ESS technologies can be more relevant for other warship applications, the extensive power requirements for ASW operations on a frigate make them less practical owing due low energy densities. A frigate usually has multiple operating modes and ESS can be coupled to the main grid to extract excess power from prime movers or it can be employed to cater to excess power requirements for main propulsion or hotel loads. Three most relevant scenarios were studied and simulated for this paper. Navies tend to operate multiple generators to share the electrical load so as to achieve acceptable levels of redundancy, even during low electric power demands. This is also true when manoeuvring on port approaches. An ESS could allow single generator operations when the ESS acts as a back up or ride through power supply in case of generator failure. An ESS can perform load-levelling operations by supplementing an efficiently run diesel engine during peak demand and absorbing its excess energy during a transit operation. Allowing the generator to operate efficiently at a near constant load will reduce fuel consumption and emissions and avoid most severe transient conditions e.g. a sudden demand such as an induction motor start, when combustion efficiency of diesels is poor. Stealth Mode is the most important scenario from a mission perspective. Therefore, it is used to size the ESS. In this mode of operations, the ESS will be the sole source of power for propulsion and hotel loads. The speed and duration for which the vessel will need to operate in stealth mode will dictate the kWh capacity of the ESS. Anti-Submarine Warfare (ASW) is an example in which stealth mode could effectively be applied because of the reduction in noise signature as it allows the diesel engines to be switched off. This scenario is very useful for the new Netherlands M-frigates as these ships will be specialised in ASW. Stealth mode does not however need to be reserved for stealth missions only since the ESS can be used during port approaches or when sailing through the increasing amount of Emission Control Area’s (ECAs). Figure 3 shows the Li-ion battery and an electric motor integrated into a typical hybrid power and propulsion system (one shaft shown). A four-quadrant inverter controls the electrical machine so that it acts as a propulsion motor supplying power to the propulsion shaft via a gearbox. Moreover, it could act as a generator in a power take off arrangement with generated electrical power being returned to the power system and stored in the ESS. The ESS is connected to the electrical system and operates to supply power to the ship’s power and/or propulsion system or absorb excess power from the prime movers when operating at their optimised efficiency. In order to simulate the power flow realistically, the cycle losses associated with the ESS have also been taken into account, shown in Figure 4. 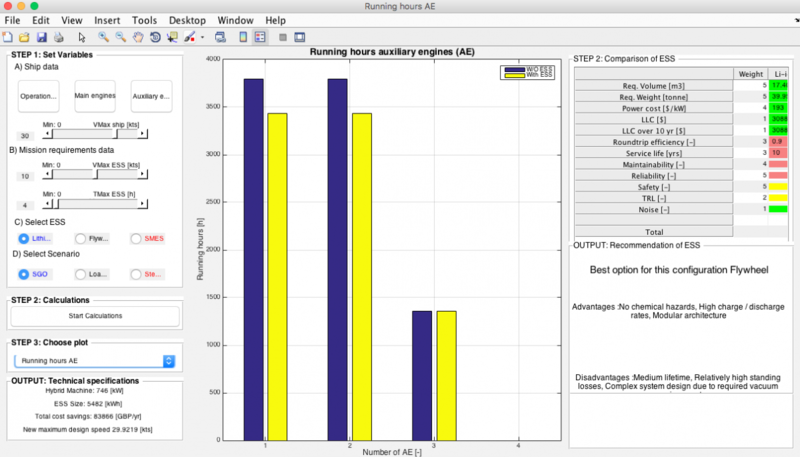 To compare the power and propulsion system operating with and without ESS a computer simulator program has been designed, built and validated using MATLAB. This work built upon early MSc project investigations by the authors on Hybrid Propulsion and Energy Storage Systems, which were integrated to undertake this study. Figure 5 shows a screenshot of the computer simulation program. The left hand side shows the User Input that includes the operational profile of the ship, engine rated powers, ESS and scenario type selection radio-buttons and the variables ((knots) and (hours)). The later two variables allow the user to enter the maximum required speed and the maximum continuous time durations for a stealth mode mission and thereby allowing the program to determine the capacity of the ESS. The simulator has been used to investigate the Lithium-ion based ESS on the Karel Doorman-class multi-purpose or M-frigate. The M-frigate is a 3000t displacement frigate with a CODOG propulsion arrangement of 2 x Rolls Royce Spey (12.75 MW) gas turbines and 2 x Stork-Werkspoor (3.7 MW) diesel engines. There are also four DRo218k type auxiliary diesel generators rated at 650 kWe approximately. No data underscoring the power requirements for replacement frigate could be found in the public domain, hence the simulations are based on the data available for the existing class of M-frigates. The first investigation considers the application of an ESS for the Single Generator Operation scenario and the second case analyses for Stealth Mode based operations. The simulator is used to search for those opportunities where the electric load can be shifted from multi-generator operation to single generator operation. The ESS would be used to provide instantaneous backup power in case of diesel engine failure but also allowing the diesel engine to operate more efficiently by absorbing sudden changes in demand. In Table 3, operating modes two, three and four have an electric load demand of 600 kWe. Without an ESS, the electrical load demand would usually be supplied by two generators to ensure sufficient redundancy and switchover capacity of the essential loads. The load on each of the two generators would be 46 percent, which is not ideal from a fuel consumption and maintenance point of view. However in the ESS-backed scenario, only one generator is required to supply the service power since the appropriately sized ESS will provide the redundancy. A single prime-mover load would allow for 92 percent improved performance. A major benefit observed during the course of simulations is the savings in annual running hours of the diesel generators, which reduces from 8850 to 8250 hours (Figure 6). The reduction in running hours and an improvement in specific fuel consumption translates into reduced fuel and maintenance costs. Moreover, reduced fuel consumption also has a positive impact on exhaust emissions. This initial result in a SGO meets a strategy of the OES 2015 to use fuel smarter and therefore reducing the fuel consumption. Moreover, the new design for the M-frigate with ESS and hybrid propulsion technology makes the class economically and environmentally ready for the future. In the software simulations, for a typical stealth scenario, it was assumed that the mission would require a reconnaissance speed of 10 knots for a period of 4 hours. This translates into a Lithium-ion ESS power pack weighing 48 tonnes and rated at 5.4 MWh. The ESS size was calculated using equation 1. According to the estimated operating profile, the vessel can typically spend up to 700 hours (20 percent annual operation time) operating under stealth mode. An average hotel load of 600 kWe with intermittent loads reaching up to 800 kWe, were assumed. These power surges can be experienced during manoeuvring for example during port approaches, with the use of a bow thruster. Whilst this is attractive from a military operations perspective there are also benefits to the environment. Figure 7 shows the annual CO2 emission with and without ESS-enabled configurations. The relationship between the fuel burnt and CO2 produced has been used according to US Environmental Protection Agency’s guidelines, equation 2. Interestingly, the ESS type impacts the CO2 savings. In the case of Li-ion, a drastic reduction in CO2 quantity is observed. This suggests lower fuel consumption for the annual cycle and can only be achieved by better Specific Fuel Oil Consumption (SFOC) figures as compared to the without-ESS configuration. In spite of additional losses associated with battery cycle, the program suggests overall emission savings. 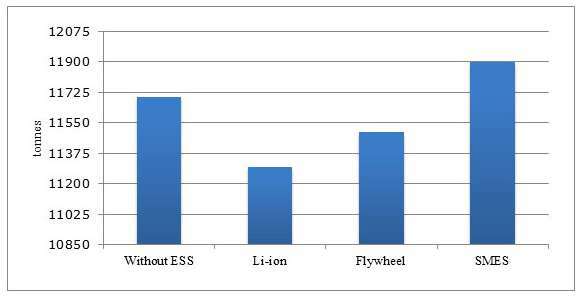 Figure 7 also shows relatively higher emissions by using a flywheel as that ESS is less energy dense. Moreover, the SMES led architecture emits even greater emissions than the original layout. The higher emissions are the result of the added weight of this ESS. As compared to 48 tonnes of Li-ion storage system, SMES increases the tonnage of the ship by 2600 tonnes. Currently, such a weight addition does not result in a viable design option as this almost doubles the warships displacement. A warship with Δ>5000t has different roles than the M-frigate is designed for. Therefore, in the case of SMES, the CO2 emissions turn out to be significantly higher. 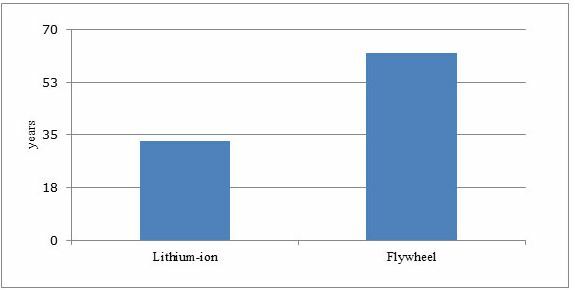 According to figure 8, Lithium-ion and flywheel based ESS offer significant reduction in annual emissions whereas SMES on the other hand, fails in comparison due to the increased tonnage of the ship that has an adverse effect. The assumption is that the M-frigate runs on Low Sulphur Marine Gas Oil (LSMGO), with a sulphur percentage of 0.1 percent by weight and hence the SO2 emission results in all four cases are well below the emissions limits. The technological amalgamation of ESS with hybrid systems can be deemed viable if it justifies the cost of investment. The annual cost of operating a naval ship can run into millions of euros. Therefore, the simulator calculates the annual cost savings obtained by the use of ESS and the total investment cost on ESS is compared with the through life savings achieved. This would determine the economic practicality of implementing the technology. The annual cost savings over a non-ESS platform is achieved by means of reduced fuel consumption and substantially lower cost of maintenance. The fuel consumption based on the operating profile for the three investigated ESS are shown in figure 9. It is interesting to note that when compared with a non-ESS platform, the Li-ion based vessel shows a reduction in both MEs and AEs fuel consumption figures. The drastic reduction in AE and ME fuel consumption figures were expected because of the Li-ion ESS taking up loads during stealth operations. 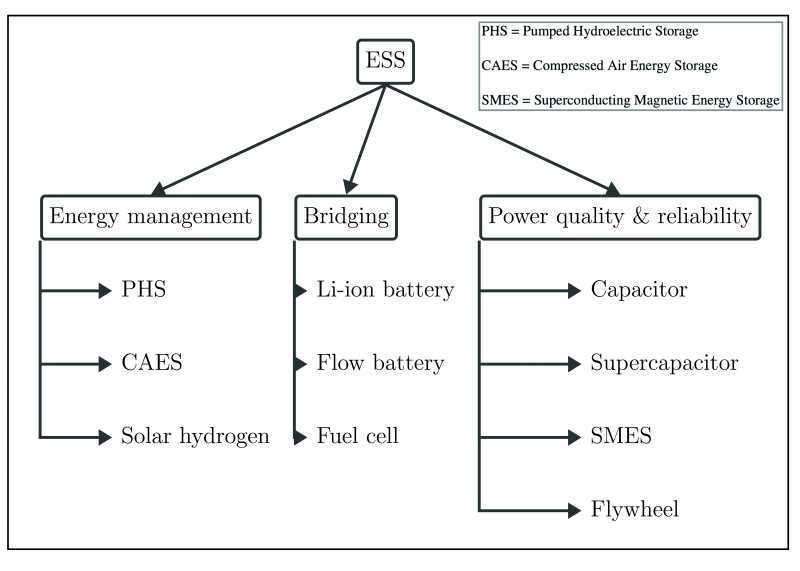 At other times, the ESS allows MEs to run at optimal load by extracting the excess power for charging. The Planned Maintenance System (PMS), which is operated on most modern fleet naval and commercial alike, is running hours based instead of condition based. This means that after fixed hours of operation, machinery components are renewed or replaced. This process involves the cost of new spares, consumables as well as the cost of performing specific tasks for which usually a service engineer is required. A maintenance cost of 89€/MW/h, chosen for the analysis, is a conservative estimate especially considering the cost of certain spares, which could run into thousands of euros. 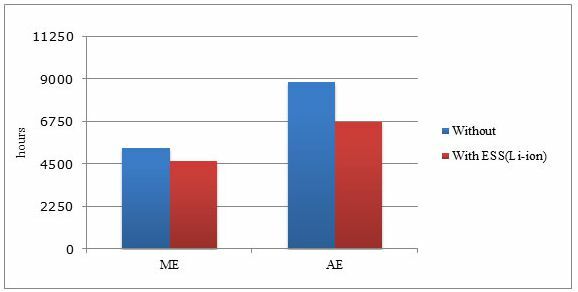 The cumulative running hours for MEs and AEs are calculated with and without the use of ESS. The running hours for an annual cycle are captured in figure 10. In a M-frigate, ME 1 and 2 are the smaller engines (3.65 MW) that are operated during the slow speed sailing conditions. Analysis shows that 700 running hours have been saved on these engines by switching over to ESS during stealth mode. On the other hand, engine 3 and 4 are the larger sized GTs that serve the propulsion power during sprinting and consequently do not benefit from ESS. In case of the AE, there is a reduction by 2100 running hours, for both AE 1 and AE 2. The savings in running hours based maintenance for MEs and AEs comes out to be around 100,000. The life of a warship can be expected to be about 35 years. Therefore, in order to understand the viability of ESS from an economic point of view, the cost of investment for a period of 35 years was calculated. Table 4 presents the life period of each of the three ESS. This implies that for serving a warship for 35 years, the Li-ion battery would have undergone three complete renewals. Similarly, flywheel and SMES would require at least 2 resp. 1 complete renewal. Thus, during the calculation of total cost of investment, the cost of ESS renewal was also accounted for. However, due to the depleting cost of raw materials for ESS production, a discount rate of 4 percent per annum was applied to the cost of ESS. The cost savings based payback period shown in figure 11 the viability of Li-ion based ESS system over the others. In fact, SMES could not offer a payback period due to extremely high cost of investment. Also, from a volume and weight point of view, flywheel and SMES based technologies are too bulky to be fitted to a warship. This research is carried out to find out whether investing in ESS technology is viable for frigate-sized warships. 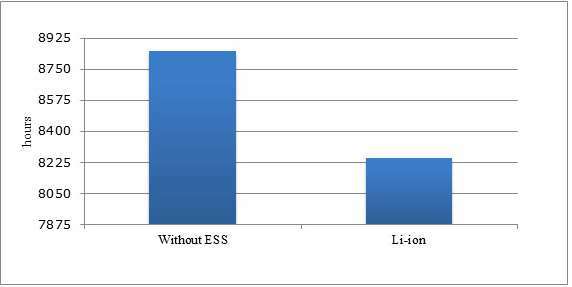 According to the results, ESS technology proves its advantages whereby the Lithium-ion technology is the most preferred choice. A payback interval within the service life of the warship, combined with high specific energy density makes it an affordable option for most naval applications. The analysis proves that there are many benefits in integrating an ESS into a warship. A significant factor is the reduced noise signature offered with an ESS operated warship. This will allow the navies to actively engage in stealth warfare; in particular ASW. The fuel cost savings, lower maintenance costs, engine operation at optimal loads and significant environmental benefits are the other offerings of this technology. The results from the program test and validate the adaptability of this novel technology against all three scenarios – SGO, load levelling and stealth/ESS operations. Assumptions have been made in certain areas e.g. vulnerability of ESS according to warship specifications are not taken into account and prognosis of prices may change in the future. Therefore the authors’ recommendations are to carry out a high-resolution study that shall further investigate the impact of ESS in terms of vessel tonnage. 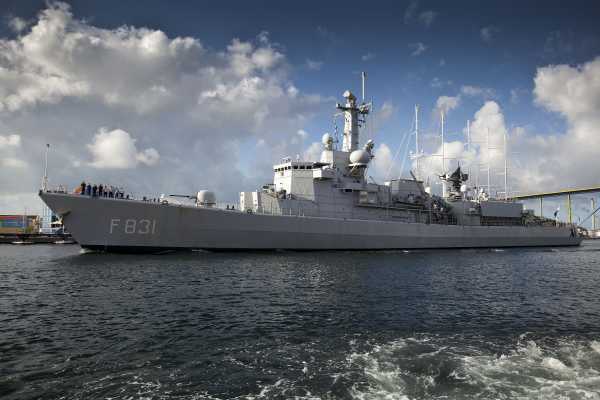 Lastly, it would be appropriate to conclude that the combination of ESS and hybrid propulsion technology can transform the future generation Karel Doorman-class fleet as a class leading frigate that is versatile, environment-friendly and economic to operate. * Akshay Bhatt is a marine engineer currently pursuing his graduate programme with Rolls Royce Naval Marine. He finished his Masters in marine engineering from University College London (2015). Prior to his MSc, he worked as an operation and maintenance engineer in the commercial marine sector; Nadine Arsenie is currently assigned to the USS Anchorage LPD23 via a personnel exchange program. Prior to this, she obtained her BSc at the Netherlands Defence Academy and her MSc in Marine Engineering at University College London. The authors would like to acknowledge Professor R.W.G Bucknall (University College London) who encouraged them to submit this paper. Besides, the authors gratefully appreciated the support of the Dutch Defence Materiel Organisation. Bas Kwasieckyj, Hybrid propulsion systems. Efficiency analysis and design methodology (TU Delft, 2013). Operationele Energiestrategie (in Dutch). (The Hague, ministerie van Defensie, 2015). Vervanger M-fregatten (België en Nederland). (in Dutch, December 2016): http://marineschepen.nl/schepen/nieuwe-fregatten-2023.html. Analysis of Commercial Marine Vessels Emissions and Fuel Consumption Data. (Washington, D.C., U.S. Environmental Protection Agency , Office of Transportation and Air Quality, 2002). Barbara McIntyre and Gail Gemmel, ‘Selecting the Type 26 GCS power and propulsion design’ SNAME (2014). R. Fitzpatrick, Magnectic Energy (2006). Retrieved August 2014, from http://farside.ph.utexas.edu/teaching/em/lectures/node84.html. H. Chen et al., ‘Progress in electrical energy storage systems: A critical review’ in: Nature Science 19 (2009) 291-312. J. S. Thongam et al. ‘Trends in Naval Ship Propulsion Drive Motor Technology’ at: IEEE Electrical Power and Energy Conference (EPEC) (2013). 7. IEEE. Li-ion batteries (Nexeon Technology, 2014). Retrieved August 2014, from http://www.nexeon.co.uk/technology/about-li-ion-batteries/. Nino Marchetti, ‘German river touring boat uses clean cell technology’ (2012, October 26). Retrieved January 10, 2016, from earthtechling.com/2012/10/german-river-touring-boat-uses-clean-cell-technology. R. Fitzpatrick, (2006), Magnectic Energy. Retrieved August 2014, from http://farside.ph.utexas.edu/teaching/em/lectures/node84.html. B. Nykvist en M. Nilsson, ‘Rapidly falling costs of battery packs for electric vehicles,’ in: Nature Climate Change 5 (2015) 329-332. S. Saunders, Jane’s Fighting Ships 2014-15 (London, IHS Jane's, 2014). J. McGroarty, J. Schmeller and R. Hockney, ‘Flywheel energy storage system for electric start and an all-electric ship,’ IEEE (2005). The program uses GBP. For the purpose of this article all costs are converted to euros. R. R. Chan and S.D. Sudhoff, An approach to optimally allocate energy storage in naval electric ships (Office of Naval Research, 2011). SLt/LTZ3 N.A. Arsenie (RNLN), ESS Storage in Naval Ships Tool (London, University College London, 2014). Thomas C. Dalton and Timothy J. McCoy, Naval hybrid propulsion plant design. SNAME (S1) (2012). V. Musolina, L. Piegeri, et al., ‘Storage Systems For Transportation, Land Handling And Naval Applications’. IEEE (2012). Nadine Arsenie is currently assigned to the USS Anchorage LPD23 via a personnel exchange program. Prior to this, she obtained her BSc at the Netherlands Defence Academy and her MSc in Marine Engineering at University College London. Akshay Bhatt is a marine engineer currently pursuing his graduate programme with Rolls Royce Naval Marine. He finished his Masters in marine engineering from University College London (2015).